This charming one-bedroom apartment in Barcelona, located in the Sant Pere neighborhood, offers the perfect escape during your trip to the Catalan capital. The area is rich with history as it was the first district of Medieval Barcelona but currently it offers the best of worlds, historical and modern day attractions. Most notable sites in the area include Santa Caterina Market and Palau de la Música Catalana. If you prefer, take a stroll down one of the narrow side streets where you are sure to find hidden boutiques and charming restaurants to satisfy your palate. 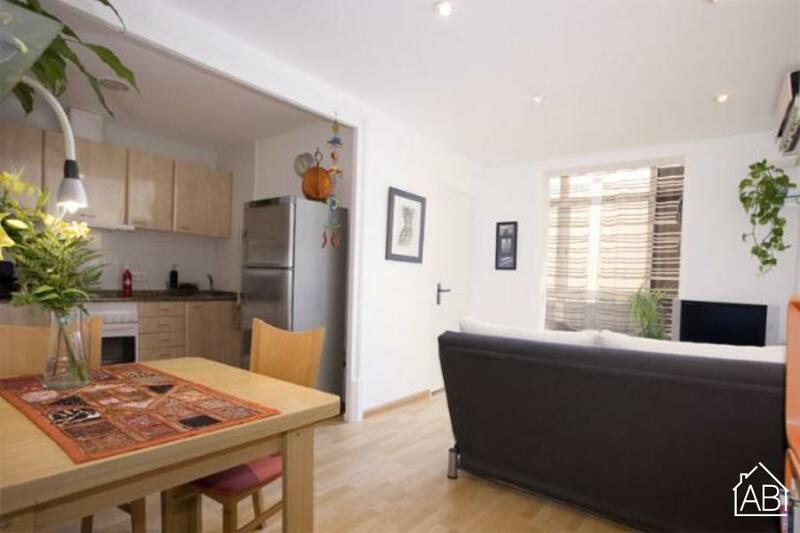 This apartment is the ideal choice for couples or families and can accommodate up to three people. This cozy and warm apartment welcomes you upon arrival with a mix of modern and traditional elements; parquet flooring, French windows (which allow natural light to fill the space throughout the day) and a neutral color scheme all add to the ambience of this lovely space. The living area has a comfortable single sofa bed, and a TV, perfect for relaxing after a day of sightseeing. The kitchen, though compact, is fully equipped allowing you to prepare your very own home-cooked meals, which you can enjoy with loved ones in the dining area. The main bedroom is furnished with a comfy double bed, while the second room is furnished with a single sofa bed. The apartment has one bathroom with a bathtub/shower. This lovely apartment, complete with heaters, air-conditioning and access to a balcony, is the ultimate choice for your trip to Barcelona, any time of the year. Metro station: Urquinaona (L1 or L4).